The black F-22 1080p Multimedia Projector with VizSim Bright Color Wheel and Zoom Lens from Barco is a professional installation projector adaptable to a range of use cases, such as flight simulators and theme park rides, museums, visitor attractions, and more. 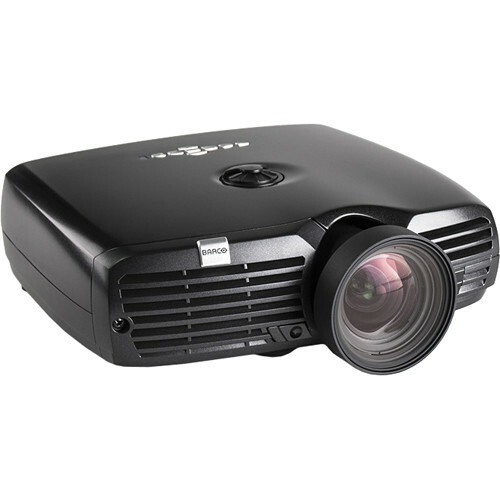 The projector features a brightness of up to 1900 lumens (depending on settings), has a native 1080p (1920 x 1080) resolution and 16:9 aspect ratio format. In addition to its native aspect ratio and resolution, through internal scaling, the F22 can accommodate a wide range of formats, from 480p SD all the way up to WUXGA (1920 x 1200). The F22 features connectivity to accommodate a variety of sources. There are HDMI and DVI inputs for HDTV and digital computer sources. There is a VGA port for analog computer sources or for integration with existing A/V installations. Plus, there are composite, component, and S-video inputs to cover most analog video sources, whether SD or HD. For remote operation, there is an Ethernet port that enables control across a local network, as well as an RS-232 port with loop-through for integration with automation systems such as Crestron. Finally, there is a USB port for direct operation from a computer. The Standard Zoom Lens features a throw ratio of 1.60 to 2.00:1. It can be considered a "middle-of-the road" lens - not short throw and not long throw. Throw ratio is one of the most important specifications a projector lens has as it tells you the image size (width) you will get at a given distance from the screen. The F22 is available with a range of color wheel options, including High Brightness, Graphics, or VizSim, each with specific characteristics. As the VizSim color wheel focuses on color quality, it lowers color cross-talk and contamination, and reduces artifacting. The Graphics version offers a lower saturation but higher brightness for general AV use, and the High Brightness option provides high-brightness while retaining accurate color reproduction. This particular projector features the VizSim color wheel. The F22 can be installed in motion simulators without extra mounting hardware. And, as there's no need to dismount the projector when replacing the lamp, you can simply take off the front panel so that mechanical and optical settings are left untouched. Thanks to the built-in real time clock and timer, the F22 can be set to perform a specific task - such as automatically starting and switching off, switching between various sources at set intervals. Up to 10 different programs can be stored individually. The F22 features INFITEC EX 3D support, a stereoscopic 3D technology based on interference filters that sees use in cinema projection and other professional visualization applications. Most projector settings and features can be set via the built-in web page, thus allowing for remote asset management. Note: Conforms to CE, FCC Class A and cCSAus standards.